Filmed today as we shifted our supply of paper for the local elections into the office in Consett. A third of a tonne of paper! I filmed this at the Lib Dem Pint event in Felling, Gateshead, last night. Team Low Fell used the event as an opportunity to sort all their target mail! 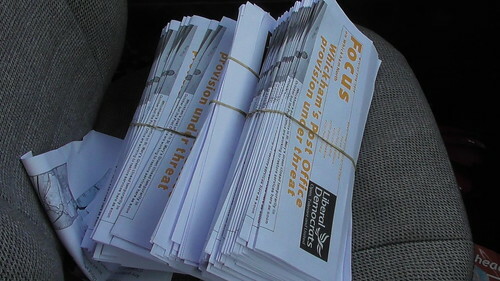 Our trip to the Lib Dem office in Consett today was not just to deliver paper for printing, It was also to sort the target mail for two wards - Whickham South and Sunniside, and Dunston Hill and Whickham East. The letters had been put into envelopes at an event on Sunday. Today was all about integrating the different letters and putting them into their delivery patches. In addition, I printed a final batch of letters for Whickham North and for Lobley Hill and Bensham and part printed my next ward Focus. We will have lots to deliver over the coming weeks! 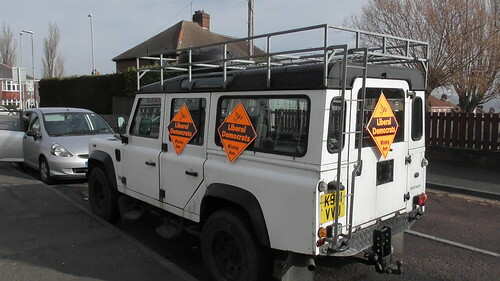 The Gateshead Lib Dem Land Rover fleet was in action today to move a third of a tonne of paper from Newcastle to the office in Consett. We are now stocked up for the local elections! At current rates of leaflet production however, I can foresee our having to restock by the end of April! 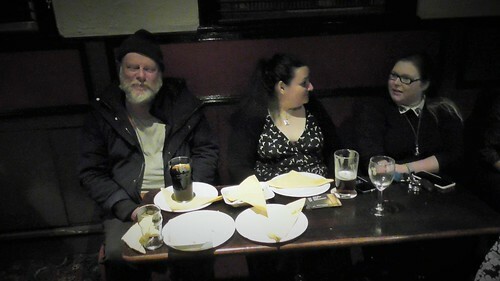 The Old Fox in Felling was the venue for Gateshead Lib Dem Pint last night. No Lib Dem event can be held without some work being done on literature. This event was no different. Team Low Fell turned up with over 1000 letters to sort and bundle up. 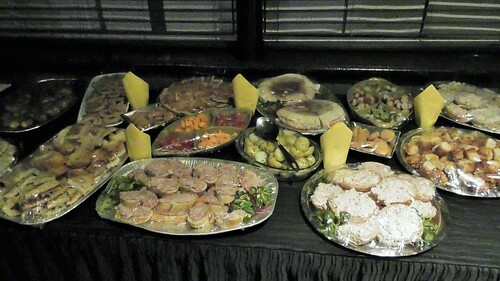 Meanwhile, the buffet catered for all tastes and diets. And there were plenty of empty plates at the end of the evening. I attended Gateshead Council Cabinet his morning. There was only one item on the agenda: proposals for a clean air zone in central Gateshead and Newcastle. One of the options is to charge all vehicles to cross the Redheugh, Swing and Tyne Bridges, other than a few ultra low emission cars. All other cars will be charged the same amount, regardless of their emissions. I am not convinced this will work. Pollution charges are all about getting people to change their activities from dirty to clean. A pollution charge should, ultimately, collect no revenue as people shift to cleaner activities. This will simply not happen on the bridges over the Tyne. Everyone who has invested in low emission vehicles will pay the same as people driving the most polluting cars. There is no incentive to go green. Indeed, the plans could be counter-productive. To avoid the charge, people are likely to drive west to get to the Scotswood or Blaydon Bridges, causing further congestion there and leading to longer journeys and therefore more pollution. I put these points to cabinet and, interestingly, my comments were supported by Cllr Mick McNestry. Nevertheless, it looks like this flawed, counter-productive scheme will go ahead. 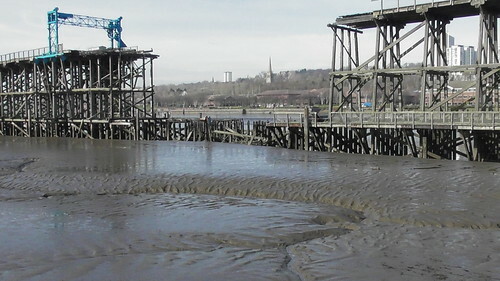 A few days ago, the Dunston Staiths, the biggest wooden structure in Europe, was damaged by fire. It is highly likely that this was deliberate arson and it is not the first time the historic structure has suffered in this way. Quite what drives people to carry out this sort of mindless destruction is beyond me. I decided to have a look myself at the damage earlier today. I took a walk along the riverside cycle way which gave me clear view of the Staiths and the damage. Hopefully, repairs will be possible. News is breaking that Labour are to back a referendum on the Brexit deal. Hooray! But don't forget, this is the Corbyn Labour Party we are talking about. Corbyn is a Brexiter and he has been dragged kicking and screaming and at a snail's pace to the point we have now reached. At this point however, we don't know what Labour's referendum will be about. Will it be about Labour's pie-in-the-sky Brexit versus what? No deal? Remain? At this point all we can do is to keep our fingers crossed that Corbyn will propose a referendum between May's deal and remain. But don't count on it. Corbyn is a weasel who will do anything to get out of Labour's commitment to a referendum. But if Labour are now to support a referendum of the current deal versus remain, this will be a game changer. Be ready to put up the bunting...but not yet! A milestone has been passed. Recently, this blog recorded its half millionth visit! Hooray! The challenge now is to see it I ever get to one million viewings. I am likely to be seriously elderly by then! 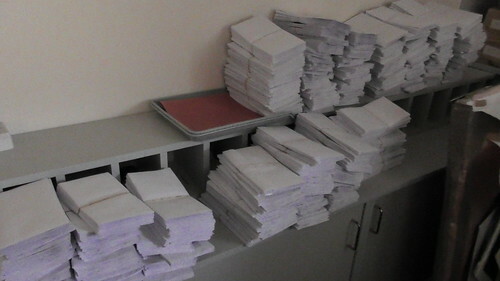 I filmed this at our envelope stuffing party in the Lib Dem office in Consett today. While putting letters into envelopes is something of a dull task, put a bunch of people together to do the job and somehow it becomes quite fun! Another Sunday and another day of putting letters into envelopes. 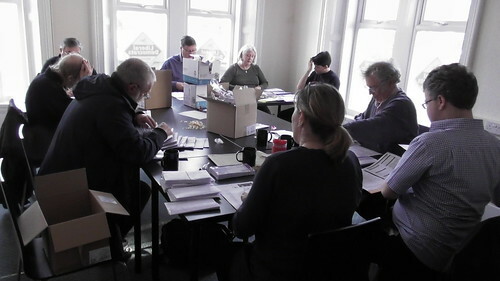 A group of Lib Dems from Gateshead ventured to the office in Consett and sorted the letters for three wards: Whickham South and Sunniside, Dunston Hill and Whickham East and Low Fell. We got through more than we expected so we've had to stand down (for the moment) the people waiting to do the remaining envelopes. All we have to do now is deliver the letters! Video filmed at our action day today in Lobley Hill. On Wednesday I spoke in support of a planning application to extend the Woodmans pub on Fellside Road, Whickham. Gateshead's planning committee considered the plans for the creation of a function room at the pub. This was a rare event for me - supporting a development in the greenbelt. But I believe there are sound and exceptional circumstances for this development to go ahead. The tourism industry in the Derwent Valley needs more infrastructure and we need small businesses to step up to the plate to provide it. But the planning system greenbelt restrictions can act as a brake on necessary and carefully planned developments. I want to give you three reasons to support this application. 1)we don’t have enough high quality function rooms in Gateshead. 2)the plan complements the council’s rural economic strategy. 3)we currently have inadequate infrastructure for the growing no. of visitors to the Derwent Valley. Gateshead has major visitor attractions, such as the Sage, Baltic and Gibside. But we need smaller scale facilities as part of our visitor economy such as small hotels, restaurants and, as in this case, function room facilities. Co Durham, Northumberland and Newcastle have many high quality function room facilities similar to what is proposed here. This proposal helps address that shortage in Gateshead. It will generate 15 jobs and more business rates for Gateshead. The Woodmans is in the greenbelt but the greenbelt was never established to pickle what is there. 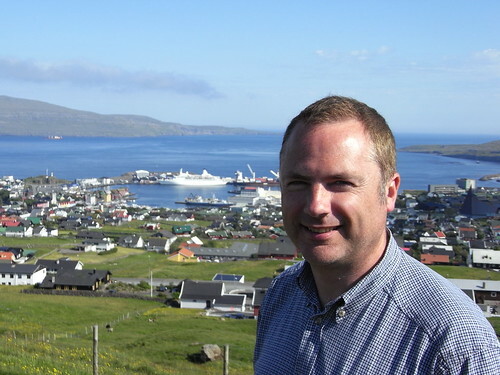 Businesses in the greenbelt should be able to grow within the confines of the planning system. As a business that has recently won national awards, it is putting Gateshead on the visitor map. We want more of that and this development will deliver this. Finally, the Land of Oak and Iron is a unique project. Infrastructure is urgently needed if the project is going to give our area a long term boost. To ensure increasing visitor numbers are catered for, we need small businesses to step up to the plate and invest in the visitor economy. Most of the Land of Oak and Iron project area is in greenbelt. If Oak and Iron is to be a success, some limited development is needed in the greenbelt. Without that investment and careful development, the visitor economy in the Derwent Valley will not cope and visitor numbers could fall away. Oak and Iron is only one of three Heritage Lottery funded landscape projects. It conserves both the natural and industrial landscape of the area. This application has the backing of Mick Wilkes, director of National Trust Gibside, who phoned me yesterday and asked me to put his views to the committee today. He shares my belief that additional facilities are needed if the Derwent Valley and Land of Oak and Iron are to have a sustainable visitor economy. Fellside Road is not without recent greenbelt development. East Byermoor Guesthouse was given permission to build a storage shed thereby helping the business expand. Birdhill house across the road has recently undergone a major rebuild. Whickham Golf Club is now enjoying new facilities, opened by the mayor two years ago. The Woodman’s application is a modest extension at the rear of the building which does not affect the openness of the greenbelt. So, this application gives Gateshead an opportunity to compete with neighbouring areas, complements the council’s rural economic strategy and contributes towards the growing visitor economy in the Derwent Valley. We need infrastructure in place to ensure the project’s long term success. That is the exceptional circumstance why the greenbelt restrictions need to be relaxed in this instance and this application approved. I'm pleased to report that our Lib Dem action day in Lobley Hill was a success today. We had a street stall (actually my land rover covered with posters) from 10am to 11am from which we I dished out our Lobley Hill Focuses to members who came along to help. All patches were allocated and delivered! So 2000 homes got our message. Some of us then headed to Dunston Hill to do a survey. 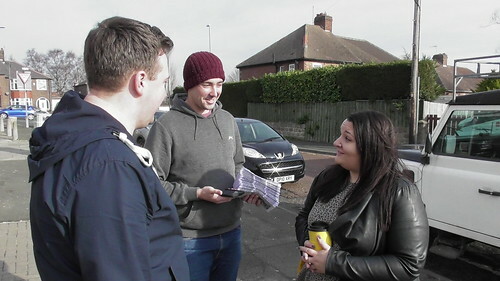 We also had an action day in Felling and Pelaw and Heworth wards. Reports from there are positive! Me and my land rover which had the role of street stall for the morning. 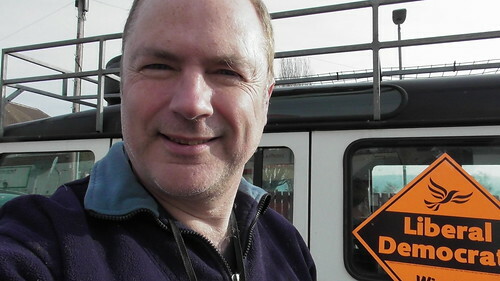 The latest edition of Gateshead Lib Dem members' email newsletter was published last night. It features the action days we are having in Lobley Hill and Bensham, Dunston Hill and Whickham East, Felling and Pelaw and Heworth wards tomorow, Saturday 23rd February. Also featured is our tabloid and our "Six to Fix" local manifesto. You can see the newsletter on this link. We will be in Lobley Hill tomorrow helping our council candidate for Lobley Hill and Bensham, Nick Seaborn, deliver 2000 Focus newsletters. They are all sitting in my sitting room at the moment but they will be heading down to Lobley Hill tomorrow morning when we will also be holding a street stall. A decade ago we came within about 50 votes of winning the ward bit it slipped back into being strong Labour. We have every intention of turning that around with the aim of winning it in the near future. 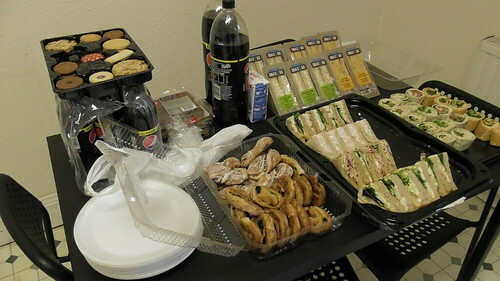 We had a gathering in the Lib Dem office in Consett on Sunday to put nearly 5000 letters into envelopes, print more letters, print the Lobley Hill and Bensham Focus and eat sandwiches! A successful day though it became a bit surreal when the talk around the envelope stuffing table turned to memories of the 1908s! I was in Dunston on Saturday to deliver more Focuses. Key story in this edition was the air pollution levels on the nearby A1. While the government are requiring Gateshead Council to deal with illegal levels of emissions in central Gateshead, ministers are yet to put forward any proposals for reducing emissions on the A1, a road for which the government is responsible. Now is't that odd! Labour's split today has formalised something that has been gradually underway for months. But how does it affect matters up here in the North East? My main concern is about whether or not the Labour party will back a referendum on the Brexit deal. I suspect the departure of the 7 MPs won't change Corbyn's position - he is a Leaver and has done everything he can to resist a further referendum. I'm not expecting any defections from Labour in the North East. They are too tribal here. Is there a prospect of cooperation between the Lib Dems and Independents? Possibly, though quite how it will function is difficult to see. It's early days and, like Brexit, no one can see the way forward through the fog of confusion. Our Lib Dem tabloid has started to hit the doormats of Gateshead. 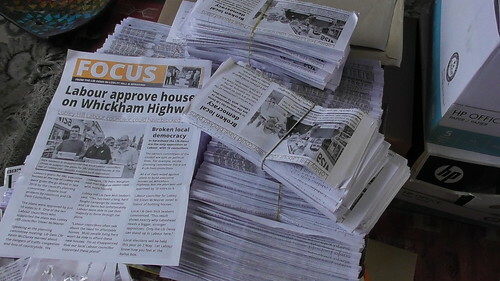 Bensham (part of Lobley Hill and Bensham ward, which we will be targeting in future elections) and Saltwell started to receive their copies this morning. Delivery will be rolled out over the next few weeks over other areas of Gateshead. 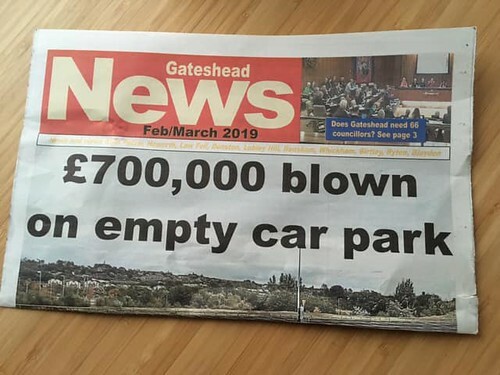 The lead story is the £700,000 spent on building a car park by Labour-run Gateshead that hardly anyone uses. We also have features on our "Six to Fix" (our local manifesto), on Labour waste and the need to build houses in the right places on the huge brownfield sites in Gateshead, rather than on former greenbelt which is Labour's favoured option. So look out for Gateshead News coming through your letterbox shortly. I recorded this at the end of January - it was after a Gateshead Council advisory group that had been held to consider the budget. The Council has a £29 million funding gap to bridge so some painful decisions have to be made. Nevertheless, there were some proposals in the budget which, even in the times of pre-austerity, would have been the right ones to take. A couple of examples spring to mind. The Council has a large fleet of vehicles and therefore a large fuel bill. However, if staff are sent on a training course on how to drive more efficiently, a saving on fuel of £120,000 would be possible. I pointed out that this is something good not only from the financial point of view, but from an environmental perspective as well. Another interesting example of making savings but also improving the service was with children's services where earlier intervention leads to greater savings in the future as issues are tackled more quickly before they escalate into bigger problems. This is a reform that should have been done regardless of the current round of cuts. So, while none of us want to be in the austerity suffered by local government, a few very small positive flashes of gold can be seen in the pan. 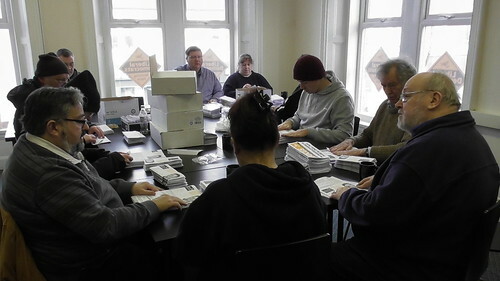 We are having an envelope-stuffing and Focus printing day today in the Lib Dem office in Consett. There are about 15 of us here. The letters we printed through the week and currrently being folded and inserted into envelopes. 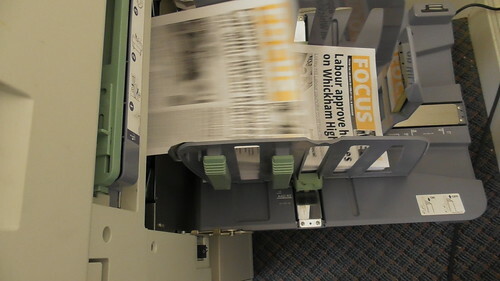 And more are churning off the printer, as is our next Focus, this time for Lobley Hill and Bensham ward. Oh the joy of having a blog that is widely read (and not just by the usual suspects in the Labour Party in Gateshead!) The above news story was taken from my blog and made a full page in the Journal yesterday. 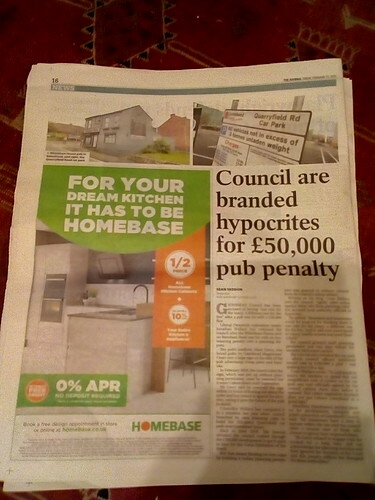 It was about a pub being fined for not having planning permission for an advert on one of its walls and then ignoring court instructions to remove it. The problem for Gateshead Council is that they went ahead with building a car park at Quarryfield without planning permission. Two days before it opened, the planning committee gave it retrospective planning permission. It has not put Gateshead in a good light. The Journal loved the story! 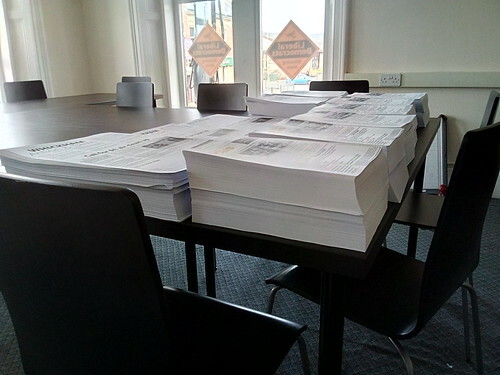 I was in the Lib Dem office in Consett yesterday and today printing a load of literature for Birtley, Whickham North and Dunston Hill and Whickham East wards. Tomorrow, I will be delivering some of what I produced. I hope the weather is as good then as it was today. I was on BBC Look North this evening, talking about community asset transfers, especially as they affect bowling greens. I was interviewed at the green in Marley Hill. I've been helping the club with its community asset transfer. Marley Hill is at the forefront of transfers of bowling greens and the people running the club are very enthusiastic about it. The story starts 10.12 into the programme. If you blink, you will miss my bit but it's on this link. The green has a nice privet hedge around it and the guys were happy for me to trim it. So 2 birds killed with one stone: BBC interview and food gathered for my goats! Friday morning was cold and windy. Perfect weather for delivering Focuses on the Glebe in Whickham. 300 Focuses later and the cobwebs had definitely been blown away! Gateshead Council rightly takes action against those who flout planning rules. If you don't have planning permission for a development that needs it and you go ahead with it regardless, planning officers will come knocking at your door. Continued failure to abide by planning rules can result in legal action taking place. Indeed, this is exactly what took place with a pub in Bensham, Whickham House, which has been hit by a £50,000 fine following failure to remove an advert on the side of the building which had been placed without planning permission. Sadly for Labour-run Gateshead Council, while applying the rules to the many businesses and residents of the borough, they forgot to get planning permission on place before building a huge new car park at Quarryfield, near the Gateshead Quays. 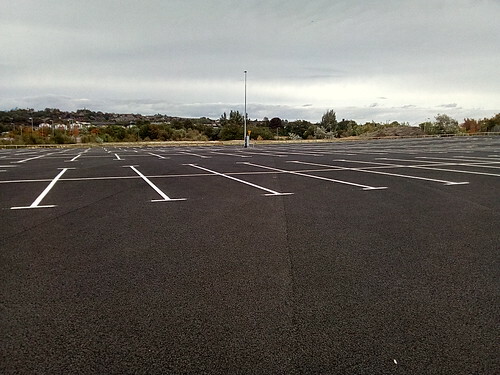 This vast car park was built in time for the Great North Exhibition last year. And then it was pointed out that no planning permission had been granted for the development. Two days before the £700,000 car park was due to open, Gateshead Council granted itself planning permission. To add insult to injury, the decision to spend this not insignificant sum of money on the car park was only officially agreed by the council cabinet three days before it opened. This rather expensive incident does not put Labour Gateshead in a good light. Residents and businesses could be forgiven for thinking there is one rule for the many, a different one for the few. And to add even more insult to injury, hardly anyone has used Quarryfield. There is a danger it will become a parking lot for white elephants, though it is unclear whether or not planning permission is required for this change of use! 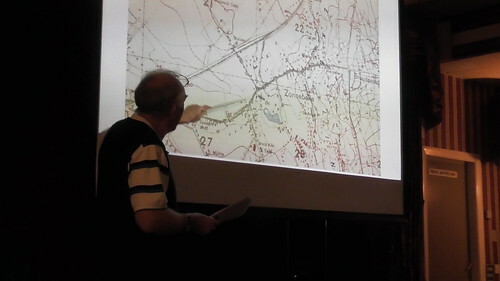 On Tuesday, Sunniside History Society, we had our monthly society meeting, and the speaker was Clive Bowery who gave us a fascinating talk about the DLI (Durham Light Infantry) during the First World War. He focused on the discovery, identification and burial of three soldiers killed during the conflict whose remained were found in the past five years. The most intriguing was 2nd Lieut Arnold Septimus Barker from the Sunderland who served with the 7th Bn DLI, who somehow got to be buried in Singapore! Clive explained that Barker was invalided out of the army no fewer than THREE TIMES through injuries he sustained during the first two years of the conflict. Following his third invalidation, he accepted a role with an oil company based in Singapore, but unfortunately he was still suffering the effects of being gassed and died there in May 1917. The next meeting is on Tuesday 5th March at 7.30pm at Sunniside Social Club where the speaker is Richard Pears talking about the photos of the Whickham area taken by Jack Medcalf. During the 2016 referendum, the Brexit campaign offered an idyllic future in which we would have all the benefits of EU membership with none of the costs. We were told the EU needs us more than we need them. We were the giant forcing those little Europeans to the negotiating table where Britain would use its superpower status to beat up all those foreigners and make them accept a British dictated future deal. In other words, Britain would leave the club but continue to use the facilities without paying membership fees, and for good measure, wouldn't even have to abide by the club rules. It all sounded too good to be true. Indeed, it was too good to be true. The past two years have demonstrated clearly that the UK is a middle ranking power having to seek a deal with an economic superpower from which we are removing ourselves. All the cards are stacked in the EU's favour simply because of economic and political reality. Now it appears that Jeremy Corbyn is putting out feelers to Theresa May, outlining a number of demands that need to be met before Labour will back the Conservative government over Brexit. So let's take a look at their demands. A permanent and comprehensive UK-wide customs union, including a say in future trade deals. While some form of customs union is possible (after all the EU conceded a customs "arrangement" in the May deal, at least as a temporary measure), Labour are in cloud cuckoo land if they believe the UK can walk out of the EU and then continue to have a say over trade deals negotiated by the EU. If Labour's demand were agreed by the EU, it would mean the UK has been rewarded for leaving with even more say that we have at the moment over EU arrangements. This is similar to the previous point. Labour seem to think Britain can create a "shared institution" in which we and the EU seem to be equal partners able to redirect the direction of the single market. So, yet again, the UK would be rewarded by the EU for leaving. The UK can be part of the single market as either a full EU member or under a Norway-style agreement in which the rules are accepted but the UK has no say over them. Dynamic alignment on rights and protections, so that UK standards do not fall behind those of the EU. If implemented, what is the point of leaving as this policy means the EU would decide our employment and environmental law with no say for the UK? More cake and eating it. Brexit is supposed to mean we don't need the EU, but here we have the UK continuing to benefit from membership of a whole string of EU institutions. No doubt Labour will dream, just like the extreme Brexiteers, that the EU will give the UK free access to these institutions and an equal say with the EU over running them. Dream on. Even more cake and eating it. So, Labour under Jeremy Corbyn inhabits the fantasy world of Superpower UK. The reality is that the EU is in a far stronger position than we are. And they are living in the same world as the hardline Brexiteers of the European Research Group. It looks likely that in the next few days, Nissan will announced that it will not go ahead with a planned investment at its plant in Sunderland. The Government promised Nissan in 2016 after the referendum something, though what is not clear. Why Nissan executives at the time accepted assurances that ministers were not in a position to deliver is one of the many unknowns of Brexit. I suspect however that Nissan's pending announcement will be the model for Brexit. Major international companies have significant investments in the UK. They won't abandon them overnight, once Brexit happens. But they will be left to be run down over the coming years. Plants in Europe will get investment, plants here will be maintained on an on-going basis until such time as patching up and cannibalising aging equipment is no longer viable. Factories will wither on the Brexit vine.